It's nine PM on the west coast, and we move back to the states tomorrow. I'm up in the hotel with a bit of a headache, waiting for the move to be over. Today I let in the cleaning crew into our old house, watched the Price is Right with Drew Carey & Beyond Planet of the Apes, came back & steam cleaned our old house's carpet, dropped off the cleaner, hit the driving range with my friends, got dinner at Boston Pizza, and waited for my daughter to go to sleep. I'll probably get to bed before midnight too. 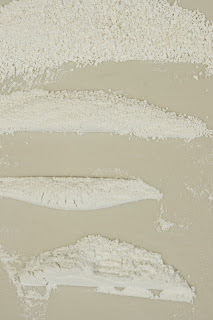 What does this have to do with the art project? Not much, but the good news is once I'm back in my old house in the states, it will be easier to do things like make a kiln from scratch, fire pit, etc. 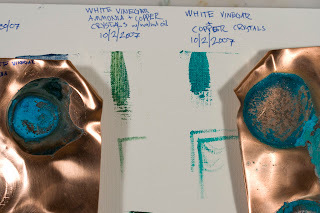 Vinegar + Copper = different types of Green! I haven't added to this blog for waaay too long! The reason? I was laid off in late October, and was looking for a job for a little while. 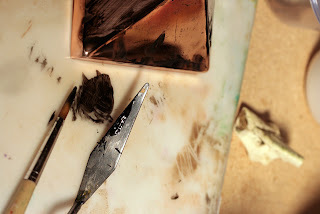 It was hard to justify playing with copper, bamboo, and crushed egg shells when I had to pay the bills. But, I found one (really looking forward to this new company!) and will be moving back to the states in a FEW FREAKING DAYS. I'm looking forward to being moved in, but I'm going to miss my Canadian friends, cheap golf & poutine. I'm in the moving eye of the hurricane right now, with nearly everything in boxes, including the project. 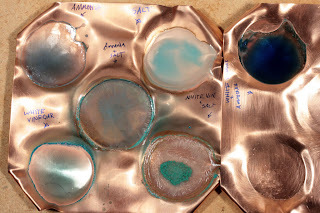 I have one new update: A vinegar/copper test matrix! So, if you've been following the entries, you'll see that I took a patina recipe online, and kept testing it to see what ingredients were actually needed. The original recipe was ammonia, salt & white vinegar. 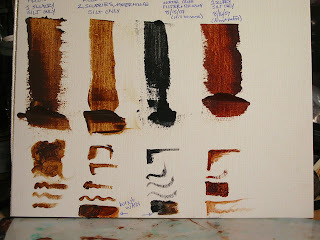 I found that anything with salt made the pigment too clumpy when mixed with walnut oil. Ammonia didn't really help much, and I think I read somewhere that Ammonia + copper = some type of carcinogenic substance (I'm probably wrong; I have NO chemistry background, and I was tired). 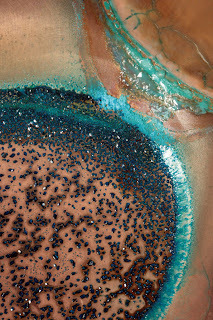 It turned out that just white vinegar & copper made some really nice blue-green crystals, which mixed really well with walnut oil. 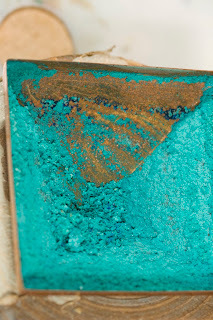 (A horrible patina, but a great pigment). Since white vinegar is not going to be as easy to make as apple vinegar, I decided to try a range of vinegars to see what I could get. I also tried balsamic vinegrette, but it just turned to muck. The results: four different shades of green! I re-did the white vinegar, and the results are very similar (I have a comparison shot, but am too tired/is not enough room/am saving it for the coffee table book). 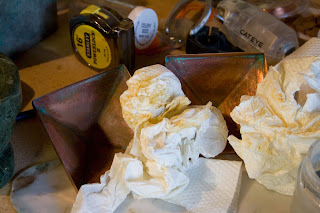 Back to packing: I decided to clean the patinas that I tested before packing them up. 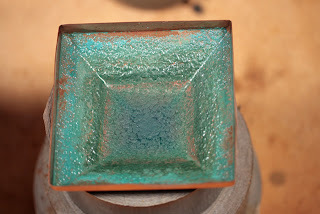 There is an interesting orange/red under the thick green patina layer. I picked it up with some paper towels. I don't know if there is enough color to make a production run, but I just might continue experimenting with this in the months to follow. Two pigments were refined this time! 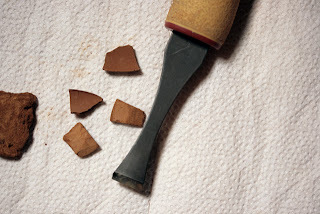 Blue clay and eggshells. For the clay, I used the standard slurry method to settle out the larger particles. Anyway, it actually makes a great dark grey! 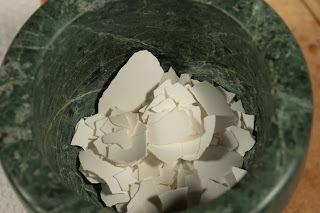 In other news, I tried crushing the heck out of eggshells to see what I could some up with. I’ve been grinding them in my mortar and pestle for about a week now, and the particles are still too coarse. b) there are other techniques I need to try to get finer particles. So, I’ll try those ASAP and then post my results! 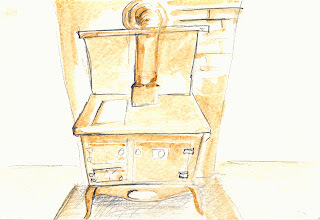 By the way, starting with this entry, this blog is have updates every other week entries for the next few months. 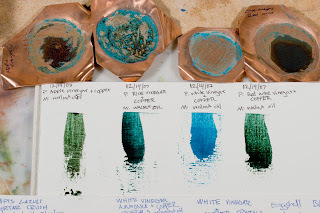 I thought I had some really promising results with the copper tests I did using the salt, white vinegar & ammonia recipe, so I decided to do a test matrix to see what would work best. (No, it did not include Trinity as played by Carrie-Anne Moss but next time you're in your home town, feel free to drop by and say hi to me & the family), I just tried every ingredient combination. My best result is to only use white vinegar. 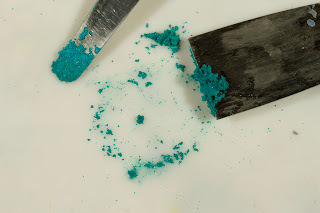 I also thought I had an incredible blue with an ammonia/white vinegar combo, but after I mixed it with walnut oil, it reacted and turned green. One other thing, as noted on some of the close-ups, I had reactions between the tests. My guess was that the vinegar & ammonia vapors reacted in the air just above the copper & oxidized it. 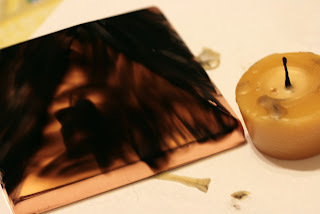 So, one more thing to try with copper before moving on: I need to do a few more tests with different types of vinegar. This time I’ll keep the samples a little further apart. Last night I updated this blog, so it is now hosted on the BlogSpot servers, and takes advantage of the neat, new and nifty layout features. Long story short: I don't have to do as much coding to get the features I want, and updating is a lot faster. Why the name change? There's already an www.artfromscratch.com is already taken. So I registered www.paintingfromscratch.com and www.paintfromscratch.com. They may eventually become the main page for this project, with a link to this very blog. In the meantime, this is the place where all the action is taking place! I’ve been pretty busy with the project this week. First off, I’ve got a spiffy new Project Status Banner at the top of my blog, for easy reference on how far I’ve come. 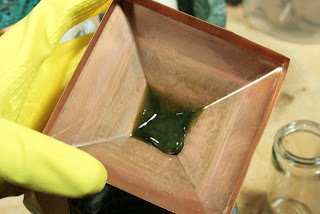 Also, I’m drying out and prepping the green copper rust from last week (hopefully I’ll be able to make it into a pigment for next entry). The blue clay that I’ve refined is taking a VERY long time to dry. I don’t think it’ll make a good grey pigment, but I might as well run the experiment through its paces. Lastly, I’ve finally gotten around to grinding and mixing the Lapis Lazuli that I picked up at Mountain Gems in Burnaby. The folks at Mountain Gems were very helpful and friendly. I called ahead before I showed up to see if they had any in stock. Not only did they have some, they also emailed me a link on how to prepare it for paint! Talk about great service. For those not in the know, Lapis Lazuli is a type of rock that used to be made into a pigment for tempra and oils back in the day. 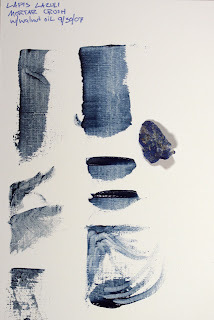 When we discovered a way to make the Ultramarine Blue synthetically, its use as a pigment diminished. This is fine, because it’s a beautiful rock for many other purposes (carving, etc). 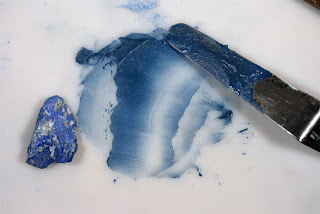 Note to any stone sculptors and jewelers out there: If you’re doing any Lapis sculpture, please contact me so I can take the unusable chips off your hands! This stuff isn’t cheap! Here’s the samples I bought, with one small piece already crushed. 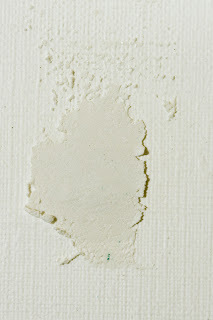 When crushing, it gives off a distinctive odor (which prompted me to put on my painter’s mask). It smells like a hair salon when someone’s getting a perm! By the way, the vinegar and ammonia each had a powerful smell, but once this was all mixed together, the smell was not bad at all. 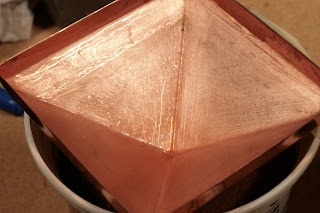 Day One: Cleaned and scoured out the copper post-topper, then filled with clear liquid. That evening, the solution had turned a wonderful blue hue. About 4 days later, here are the results, with still a little liquid at the bottom. As I put less salt into this batch, there are a lot less crystals. 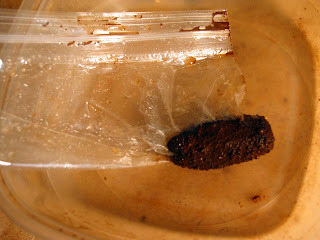 Eight days after making the batch and it is dry. Note how the color at the bottom is more blue than the rest. This may be due to it getting rained on outside last night (I left it outside to dry out a little faster and forgot to bring it in). I did a little research on how to make vinegar and ammonia from scratch. Vinegar won’t be hard… I have a friend who has made a few bottles accidentally when home brewing. Ammonia will be a bit harder. Today it’s made using the Haber Process, which uses high pressure (200 atmospheres) and high temperatures (450 C) and an iron catalyst to get Nitrogen & Hydrogen to react and form Ammonia. There are some other historical ways to produce it, and I may try those (playing vegetable and animal waste products… joy.). My other substitute (see last entry) seemed to do a pretty good job, but it began to smell pretty bad towards the end of the experiment. That and I don’t think my landlord would really appreciate me making a bonfire on his property to pull this off. This sort of thing needs done at my parent’s property. 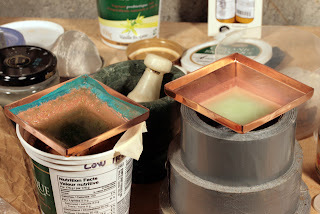 I found a recipe for patina on the web, which consisted of only three ingredients: Sea/kosher salt, White Vinegar, and Ammonia. We had the salt and vinegar at home. Believe it or not, finding a cheap $3 bottle of Ammonia was *not* easy. I called or looked in over five stores before I found it in stock at Safeway. Why so scarce? My guess is that it’s a cheap ingredient used in the manufacture of meth, so people are either buying up all the stock, or stores are not selling it to attempt in vain to cut down on meth production. Come on everybody! Haven’t people figured out yet that speed kills? Now it delays art projects too. So, while I was looking for ammonia, I tried a substitution for my first batch… one that would be easier to make from scratch too. Let’s just say that it’s a) it complies with my ‘from scratch’ rule set b) a liquid and c) I can currently manufacture more in a week than I’ll probably need for this entire project. I also tried just using lemon juice for a second test, but it just resulted in making a green snot-like goo. When I added alcohol to it, it looked pretty bad. Day 5, Had been left outside for a while, including a light mist of rain. 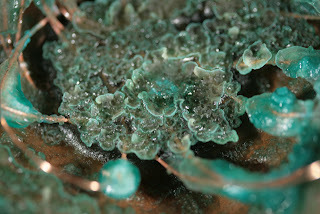 Icky green goo from dehydrated lemon juice. I couldn’t tell if the green color is from the copper or some nasty bacteria. So, I mixed it with alcohol to see if I could sterilize it and separate the pigment out. Final bottled samples. 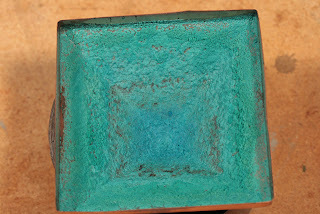 Middle sample has settled since this photo and all pigment and salt is at the bottom. 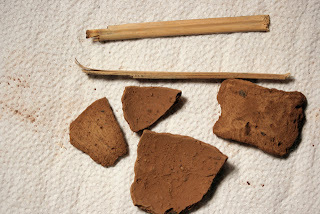 I was going to talk about the blue clay that I got from a coworker, or perhaps a list of all the things I can use now that my starting point is 4004 BC, but there’s a new development that is much cooler. 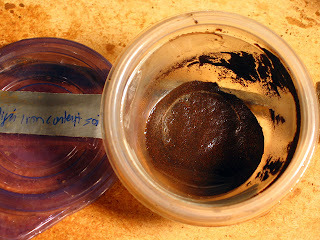 Except for two tools and a paint brush, I just came up with a production batch of Lamp Black! Um, yea. At least twice. Usually it takes more tests before I can go into production. But this one was proven out on the first try and that means my next batch will be production ready! 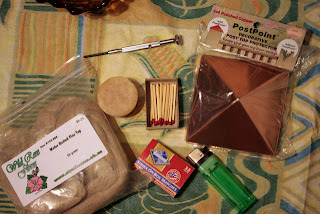 I couldn’t find my beeswax candles, but I did find some beeswax in my art supplies for Ukrainian Egg Decoration. Why beeswax? 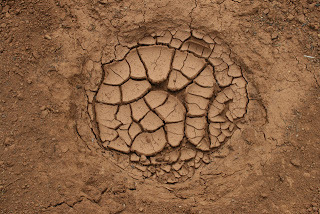 Humans have used it for at least 10,000 years (presuming of course that the earth existed for over 10,000 years. For the scope of this project, the world was created in 4004 BC, or about 6011 years). There is even evidence of it being used at Lascaux. After lighting the candle (wood fire is from scratch, as there is evidence of it being readily available to our ancestors in 4004 BC. 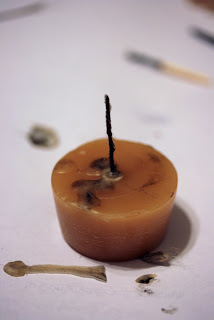 So, I felt a wooden match was OK to use. 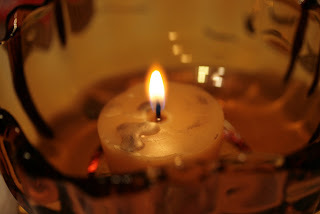 Note that I didn’t use the bic lighter in the photo, as the end result was much the same), I held the copper over the flame, and collected the soot. 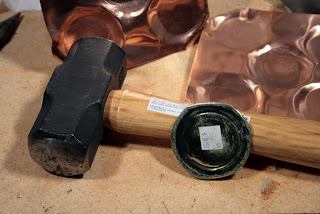 I tried to find raw copper sheeting to use as a smooth surface. No such luck at 6pm on a Saturday. But these post toppers at Home Depot did a wonderful job. 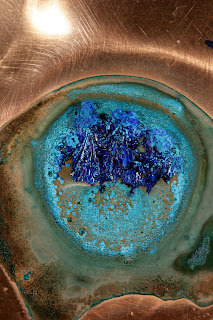 One note: copper conducts heat *very* well. Watch your fingers! After scraping the soot off with a palette knife (2nd tool not from scratch), I mixed it with walnut oil. Success! The end result is a very black, very smooth paint. 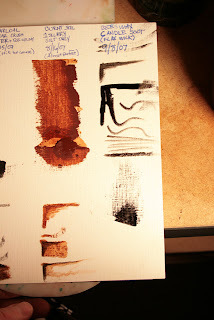 Apparently this is the same pigment used for India Ink. 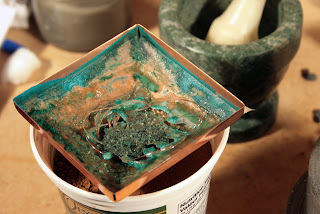 More on clay and other reasons why I bought copper post toppers next time. Over Labo(u)r Day weekend we were in Tacoma, Washington meeting my parents halfway from Portland. They brought up my production batch of pigment. (See previous video entry where I make a fool of myself). 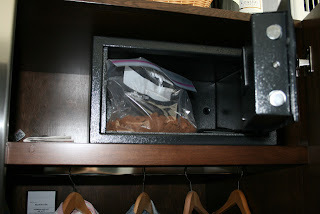 As you can see, we kept such a valuable item in a ‘safe’ place. 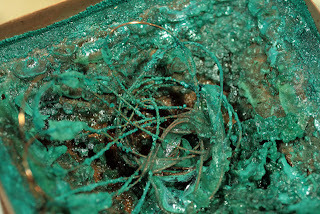 When I brought it home, I went to work on it separating the coarse back from the finer silt front. As I had to do this ‘from scratch’ I used a broken piece of old bamboo, instead of a carving knife as I did with my proof of concept batch. 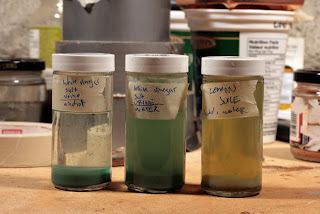 Compare the level of impurities to the Proof of Concept photos. Looks like I’ll have to refine it at least one or two more times. The good news is that a co-worker donated two 5 gallon buckets full of blue clay. 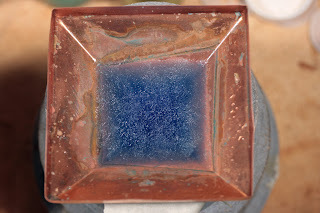 Although it doesn’t look like this will be a good source of pigment just yet, I think I’ll be able to make some containers from it to enable me to do a much better refining job! More on the clay next week. that I found in the streets of Seattle. His site explains the use of this odd looking pinball-sized sphere. How it ended up in a gutter in Queen Anne is beyond me. Perhaps the words 'naturally occurring' need to be looked at closer. They imply that humans are not part of the natural processes that takes place on earth, nor is anything we do. If you take a larger view of the world, and consider the human race to be part of nature, then our by-products are also an extension of nature. In this case aluminum powder is naturally found... in etch-a-sketches. Just like Plutonium can be naturally found, in breeder reactors. Which is exactly the point I'm making in my description of those aluminum nodules. It's both arrogant and insecure of us to imply that anything we do is somehow fundamentally different from what chorals or algae do. If you were doing your project in Africa, would you be allowed to use savannah grasses? Because the savannah is grassland only because of human burning over hundreds of thousands of years. I think the problem is where to draw the line, since by that argument, you could just go down to the store and buy anything you want. You have to find a way to draw a bright line, no hedging or it's not art. This eliminates all manufactured objects, everything made of iron, anything in a recognizable shape. But the aluminum nodules will still be washing up on the shores of the great lakes. For almost everything I see in the world around me, it seems that at some level back, smelting & loom technology come into play. I've read somewhere that it is estimated that smelting has only been discovered independently 5 or 6 times. Amazing if true. I guess the money aspect [buying material, like flax plants] doesn't bother me so much as what the materials are. As long as what you're paying for isn't processed in any non-trivial way, I don't see that the art is effected by whether you bought, borrowed, begged, scavenged, or stole it. …You've got to have a headline, a soundbite, that is immediately understandable to explain why what you've done is interesting. So, here's another random bright line you could try: Making a modern painting in 10,000BC. This concept is beginning to resonate with me. Maybe some tweaking here and there, but very close to what seems right. Loved that book by the way. which turned out to be good timing for Theo, as he was planning a trip to Seattle right around the time we were talking. By the way, if you want to get yourself or a friend an engaging Periodic table poster, buy one from Theo. The placemat version has educational and witty text describing each element on the back. So, Theo has tasked me to find a suitable starting point in time. Anything that existed on or before this date I can consider ‘From Scratch’. I did my research, and have found a very clear, if somewhat controversial date: the date of the earth’s creation! To the day! I needed to find a scholar that has been respected for quite some time, well over a hundred years. I found that in James Ussher (1581-1656) Anglican Archbishop of Armagh (Ireland). Ussher deduced that the first day of Creation began at nightfall preceding Sunday October 23, 4004 BC. So, let’s make our starting point, October 31st, 4004 BC. This gives us a little slack, just in case James made a rounding error. Also, Halloween is an easy date to remember. As much as I respect the (arduous) efforts and results of Archbishop Ussher, I also respect the findings of modern archeologists. I believe them when they say they’ve dated an object to be older than Oct 23, 4004 BC. How do I reconcile this? The easy way out is to say that the dating is wrong. This is a cop out, and I don’t cotton to this line of thinking, particularly since these dates have been made much more accurate with newer dating methodology. One could also argue that any artifacts older than this date (like tons of pottery, large buildings in Egypt, etc) were put there by the Creator to tempt the faith of archeologists, scientists, and ‘end-time’ society. Maybe. Not saying it didn’t happen (as there is no way to prove it wrong, and more to the point, I personally believe in a creator with an extreme sense of humor). I’m taking the hard line of living with a paradox. Next time, we’ll go into detail about what can and cannot be used for this art project. I took some videos of my trip to Colton, Oregon last week, and have not one, but three clips to show you! We’ve got some successes: a production run of refined pigment (my arms are still sore from this exercise!) & I found a new color source (burnt soil is much more red). 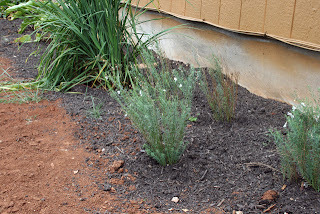 Also a couple of minor setbacks: The flax isn’t growing as well as I had hoped, and not only is it hard to remove soot from a stone, but grinding up charcoal doesn’t make for a good paint pigment (too coarse). It’ll all make sense when you take a look at the photos and videos. Here’s the dried silt from the refinement production run. Not bad for just using a rock, a stick and some water! 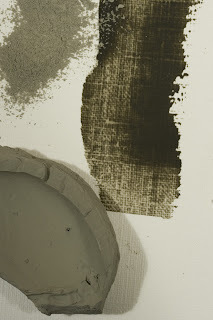 Here’s a Proof of concept shot of all three pigments: Soil, charcoal & burnt soil. I’m typing this up right now in Microsoft Works on my Mom’s computer in Colton, OR. My dad stoked the firepit, and I put a stone on top of the fire. Tomorrow morning, I’m going to see if there is a sizable amount of soot on the stone for me to take back to Vancouver. Also tomorrow, I’m planning on making a production batch of paint, by digging a hole with a stone, adding water & stirring to get the silt to rise to the top. We’ll see how it goes. While I was walking around the property, I saw some *really* red soil. My dad said that was a spot where he burned stuff before. My guess is that the heat oxidized more of the iron. I’m going to take a few samples back with me. Pictures or maybe some video later, when I get back up to Vancouver! 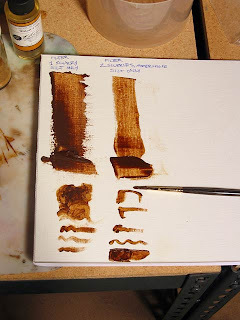 I’ve been working on a couple of processes to refine the red-clay pigment even further. 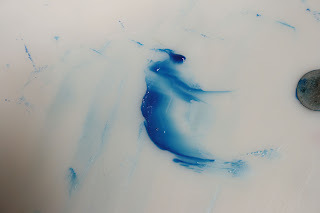 The first and most obvious one is to re-slurry already refined pigment. Make sure to click on the thumbnails below for larger images. It’s smoother, and handles very similar to low-grade commercial paint. It’s still grainier than commercial paint, but totally acceptable for this project. 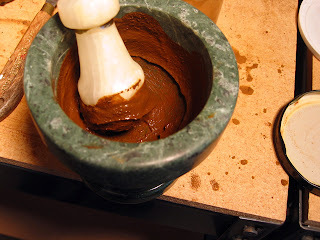 I had to use a mortar & pestle to recrush it after it dried and I worked it longer with the oil than the single slurry batch. This stuff is ready for prime time. 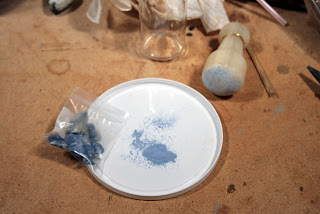 I simply took the dried pigment chips and massaged them with a wet brush until it was loaded with pigment. Single or double slurry works fine for this, and although I could add something to the paint so it wouldn’t break down into mud and crack when it dries. Here are my results. 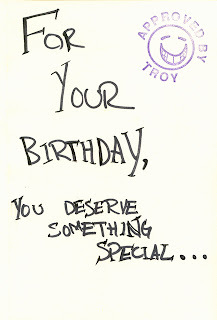 On this Birthday gift-card for my wife it reads “United States of Canada”. If you’re from America read it as “We’ll be incorporating Canada into our wonderful and fun-loving country soon, and by-golly they’ll thank us for it” If you’re from Canada read it as “Washington, Oregon & California will come to their senses and decide to merge with British Columbia” Thank you. Everyone happy & non-offended? Good. I found a magnet on a shopping cart a month or so back, and have been collecting the high-metal content soil and separating it out from the rest. I’ve since tried to remove all the dirt and see what kind of metal particles would be left. 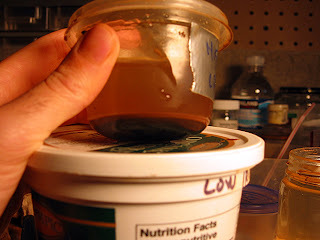 Put magnet/ziplock combo into slurry & remove into another can. The fun thing about magnetite is that you can find it lying around any beaches in many parts of the country. I collected about 40 pounds on Ocean Beach in San Francisco, in less than half an hour using a large magnet. ½ hour = 40 pounds huh? And it only took about 10 for me to get a thimble’s worth! So, enough tests for pigment! I’m going to be doing an actual “From Scratch” production run very soon! No more plastic or glass jars for me! 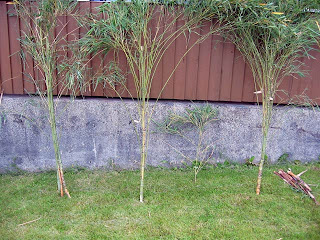 Bamboo grows really well in this region and can be used for a ton of stuff: quill-like pens, scaffolding, flutes, bike frames, mills, and practically anything made on Gilligan’s island. A quick search on Google has netted a bunch of really great photos of bamboo scaffolding, which is a testament to the strength of the bamboo & the incredible skill of the people who put it together and work on the scaffolds. 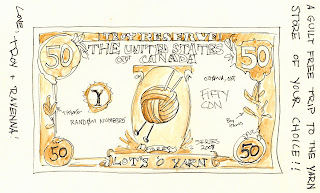 I’m hoping to make a loom, pens, brush handles, and other items with it. (‘bamboo loom’ generates some good Google results too). My manager just moved into a house, and had a bunch of it growing on his property. As he wants to landscape, he offered to let me have at taking as much as I wanted. Using only a hatchet and my hands (which if I ever use his bamboo, I’ll justify this by forging my own hatchet of similar size and quality), I chopped and pulled it out of the earth. I spent about ½ hour to get there, ½ of work, ½ hour back, another hour trimming it, and a bunch of time researching proper drying techniques before giving up and just letting it stand vertically outside my house. 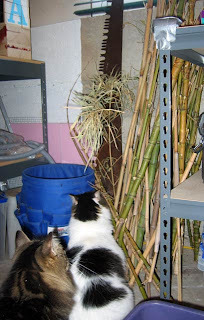 After all of this, Ravenna and I went for a walk around the neighborhood, and in our alley, found a huge bundle of bamboo (a straighter, lighter variety) on top of a neighbor’s garbage can. Needless to say, I picked up a bunch of it too. I consider this FAIR GAME for my project as A) it grew naturally in my neighborhood, B) I personally didn’t use any modern tools to cut it, so hey, my neighbor *could* have hacked at it with a really sharp rock and C) I’m not going to look a cosmic gift horse in the mouth. Now the only thing I have to worry about in the drying process is keeping it from the cats, as they are drawn to it like catnip. 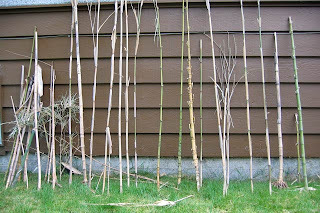 I don’t have any twine available right now, so I’m just holding onto the bamboo until I can find a decent binder for it. That’ll buy me some time to track down some good loom plans to try out. 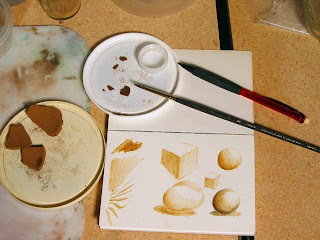 Next: Pigment update on Watercolor and refined oil color.